Scientists have discovered something nearly invisible that straddles the vast Pacific Ocean. April 10, 2002: Dip your hand into a swift-flowing stream. On either side, the current rushes faster; behind it, the current eddies and slows. But the disturbance is short-lived. Only inches beyond, the water hurries on downstream, as if your hand had never been. Now imagine this: the small wake produced by your hand, instead of dissipating, forces part of the stream to reverse course. Backwards-moving water rushes toward your fingers from thousands of miles away. 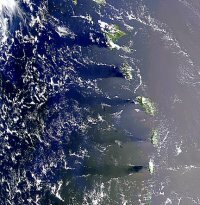 Above: The Hawaiian Islands photographed from above by NASA's SeaWiFS satellite. Credit: NASA/GSFC and Orbimage. Scientists have long known that waters downstream of Hawaii turn back toward the islands. But they also believed that the reverse current (known as the "Hawaiian Lee Counter Current") dissipated about 300 kilometers downstream. Much beyond that point, they thought, wind and water flowed on toward Asia as if Hawaii had never been. 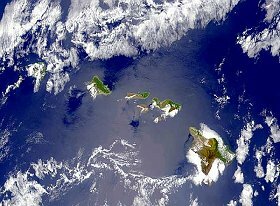 But last year, while examining data from QuikSCAT -- a NASA satellite that uses microwave radar to measure winds near the ocean surface -- researchers realized that Hawaii's wake is, in fact, much longer than they thought. Indeed, it stretches nearly 8000 km across the ocean. Timothy Liu of NASA's Jet Propulsion Laboratory and Shanping Xie of the University of Hawaii were the discoverers. Liu recalls how they found it while looking at a map of Pacific Ocean wind patterns. Close to the islands, they saw what they expected: strong winds between the islands and a low wind behind them. The pattern mostly vanished about 300 kilometers away, just as theory predicted. "But then we looked carefully, all the way to Asia, and I said 'Wow! What is going on here? This other wake -- what is it?'" QuikSCAT had revealed a subtle pattern of winds linking Hawaii to distant Asia. The warm counter current might solve part of a long-standing mystery. The Pacific Ocean is dotted with widely-spaced yet inhabited islands. How did humans spread among them and eventually reach Hawaii? Archeological and linguistic evidence suggests that the islands were first settled at least a thousand years ago by Polynesians who island-hopped from west to east. It was a remarkable feat: Using only sailing canoes they navigated vast distances against opposing winds and currents. Hawaii's wake might have provided a route by which ancient mariners migrated, says Liu. The counter current could have carried them directly from Asia to Hawaii. Because the current is warmer than the surrounding atmosphere, the air above the water convects and forms clouds. "Those clouds could have guided the ancient Polynesians along this narrow path of water," notes Liu. "We still don't know exactly how Hawaii's long counter current develops," Liu says. But he does know why it continues: a unique combination of wind and sea patterns around the island sets up a positive feedback loop that allows the backward-flowing current to sustain itself. The counter current (however it got started) carries some of that warm water back to Hawaii. The returning water heats the air above it -- only slightly, but that's enough. Heat causes the air to rise, which drags in cooler air from either side of the current. Because of Earth's rotation, the cool wind does not blow straight in. Instead, Coriolis forces cause it to swirl. The rotating winds "pump the ocean" -- meteorologists call the effect "Ekman pumping," says Liu -- and reinforce the warm return current. It's a self-perpetuating cycle. The differences in sea-surface temperature that drive the whole cycle are quite small. The current is less than a degree warmer than the surrounding ocean, says Liu. Such a slim signal helps explain why the ocean-spanning wake went unrecognized for so long. Unrecognized in modern times, that is.... Ancient Polynesians likely knew about it a thousand years before the first satellites. But they didn't understand why -- and maybe they didn't care: the fact that their canoes drifted east was enough. Nowadays the stakes are higher. Scientists want to predict global weather and chart the course of climate change. Satellites like QuikSCAT, which examines more than 90 percent of the world's oceans every day, reveal the all-important big picture. And they're teaching us that small things once thought insignificant, like small scale winds and tiny temperature shifts, can have great consequences -- like Hawaii's long, improbable wake. ; Windward Islands; Canary Islands; Cape Verde. Wake of Hawaii discovered to Extend Several Thousand Kilometers -- this Japanese website includes many informative illustrations.